Place oven rack in bottom rack position; heat oven to 350°F. Spray 2 (10-oz) ovenproof custard cups with cooking spray; place on cookie sheet. Place tortillas on microwavable plate; cover with microwavable plastic wrap. Microwave on High 45 to 60 seconds, turning after 30 seconds, until very soft. Center tortillas over cups, press into cups so top edges are even. Press tortilla folds against side of each cup to make bowl as large as possible. Bake on bottom oven rack 8 to 10 minutes or until tortillas are stiff enough to hold their shape. 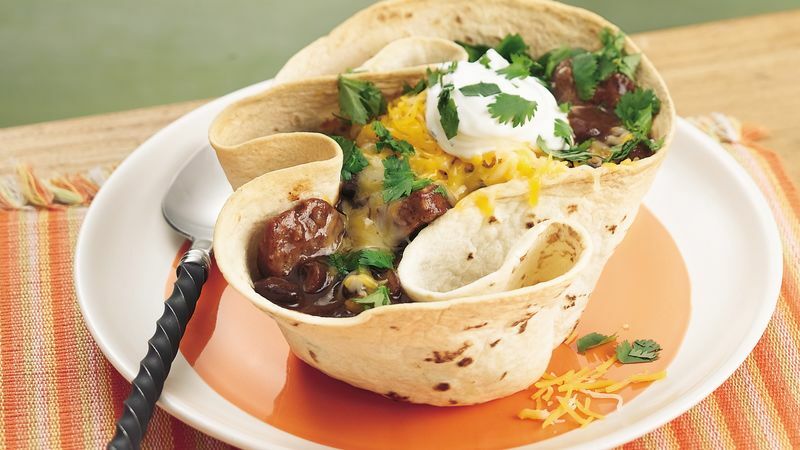 Remove tortilla bowls from cups; place on cookie sheet. Return to middle oven rack in oven; bake 5 to 7 minutes longer or until browned and stiff. Remove tortilla bowls from cookie sheet; place on wire rack. Meanwhile, heat 10-inch regular or cast iron skillet over high heat. Add sausage; cook and stir about 30 seconds or until browned. Add garlic; cook and stir 30 to 60 seconds longer. Remove skillet from heat; stir in sherry. Return skillet to high heat; cook and stir 2 to 3 minutes or until liquid has almost evaporated. Stir in chili powder, soup and green chiles. Reduce heat to medium-low; cook, stirring occasionally, until thoroughly heated. Place tortilla bowls on individual plates. Divide soup evenly among bowls. Top each with cheese, sour cream and cilantro. Serve immediately.